Crown Trade Protective Coatings’ Metal Gloss system is being applied to street furniture across a stretch of the South Wales coast to provide a fresh new look and long term protection against the elements. 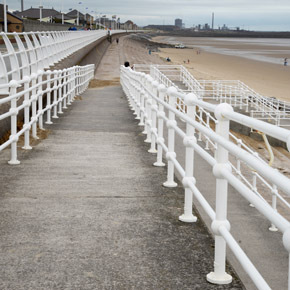 Steel railings, lamp posts and benches along a three mile promenade at Aberavon are currently undergoing a rolling programme of restoration using the Metal Gloss system. Neath Port Talbot County Borough Council originally contacted Crown Paints when the stretch started to look weathered. As a result, the Metal Gloss system was specified to deliver maximum protection as well as an attractive aesthetic in-keeping with the area’s position as a major tourist attraction. The system has been designed to offer superior corrosion protection, a durable finish and an excellent colour offer. Metal Gloss protects any ferrous or non-ferrous metalwork, including structural steelwork, railings, fire escapes, gates and shutters. The Metal Gloss system has three main components – Crown Trade High Build Rust Inhibiting Metal Primer, Crown Trade High Build Micaceous Iron Oxide and Crown Trade High Performance Gloss for Metal. The Metal Gloss system is being applied to steel railings, lamp posts and benches along the three mile promenade at Aberavon. Depending on the system applied, the products offer a choice of either 10 or 15 years’ protection. Crown Trade’s Protective Coatings T-Wash is also available for use to correctly prepare new galvanised metal. Due to the metalwork’s constant exposure to a demanding coastal environment, Neath Port Talbot County Borough Council opted for the 15 year protection system. This is achieved by applying up to two coats Crown Trade High Build Micaceous Iron Oxide between the primer and the gloss topcoat. The High Build Micaceous Iron Oxide offers an effective barrier against the water ingress that can cause corrosion, and can be used as a topcoat if colour and sheen are less important factors than protection. 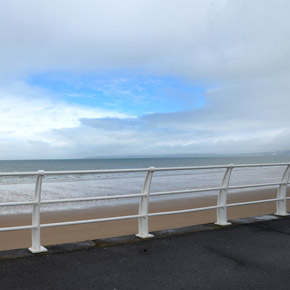 The programme at Aberavon is being carried out by the Council’s in-house painting and decorating team, targeting high-traffic areas first. Gary Havard, Senior Building Surveyor at Neath Port Talbot County Borough Council, praised the system for its durability. He commented: “The paint system is working extremely well, it’s a quality gloss that’s offering a very high specification finish.